i charge laughing - The Archive: Won't you hug my soul? Won't you hug my soul? 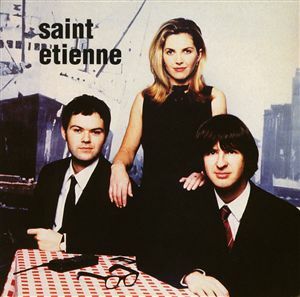 Summary: Saint Etienne is delicious indie poppiness. It is a jugular injection of exuberant daisies and moody lemonade, fresh-squeezed with extra drum machine. Rainy cafe, Kentish Town, Tuesday. orders coffee, another round of toast. But the mundane is made sublime in this pop pearl. The other song that immediately hooked me was "You're in a Bad Way." As I listened to Sarah sing over the synthesizers and peppy drum machines, I wondered why this music was not popular. It was better than any pop music on the radio, and it was just as poppy. Another important element of this album are the snippets in between songs. They put little random samples from movies or t.v. shows in between the songs, adding a bit of quirky weirdness. Each album contains a few slow songs as well, and the beautiful "Hobart Paving" is the emotional centerpiece of the album, with Sarah repeating "Baby, don't forget to catch me" as the song fades out. Anyway, back to the Louvre part of my story. I could not really afford to buy the cd (Discs in Paris were blindingly pricey), and I had no way of listening to it anyway as my Discman had stopped working. So every day during my week in Paris, I went back to the Virgin Megastore under the Louvre after the day of sight seeing. Eiffel Tower, Champs-Elysées, Arc de Triomphe, Virgin Megastore. Day trip to Versailles, Virgin Megastore. Rodin Museum, Sacré-Coeur de Montmartre, Virgin Megastore. One day, I went into the store and heard the most wonderful song playing over the store speakers. This was the week before Christmas, so Christmas music was everywhere, and I heard this duet with a pumping beat, with a woman and a man singing. I was born on Christmas day." I recognized the two voices -- one was the woman I'd been listening to on headphones each day for the past week, and the other sounded like Tim Burgess, the lead singer of another favorite band, the Charlatans UK. This was Saint Etienne's new single from their upcoming new album, and I think I was dancing in the store. As I traveled around Europe -- to Rome, Florence, Lucerne, Luxembourg, Brussels, Brugge, London -- whenever I went into a record store, I listened to "I Was Born on Christmas Day." Back stateside in January, I had a couple of weeks before school started. My family had moved to Iowa City, which had wonderful record stores. The first thing I did was buy So Tough, the album I had listened to in Paris. As the semester started, I was moving into my new place in Grinnell. I was living in a house with 5 friends, and as I unpacked, I was blaring So Tough. My new housemate Barry came dancing into my room: "What's this? I love it!" Such was the reaction of just about anyone I ever introduced to Saint Etienne. Later that semester, their next album, Tiger Bay, came out, and I loved it even more than So Tough. Tiger Bay contains their poppiest song, "Hug My Soul," as well as one of their most heartbreaking, "Like a Motorway." The aforementioned "I Was Born on Christmas Day," which starts off with Tim Burgess laughing "Roll the tape!" never gets old, and one of the group's most beautiful slow songs, "Former Lover" showcases their often melancholy brand of mood pop. My friend Jake has written eloquently about Tiger Bay -- Jake's essay. I also purchased Saint Etienne's first album, Foxbase Alpha, which features staples such as "Only Love Can Break Your Heart" (a remake of the Neil Young song), and "Kiss and Make Up." 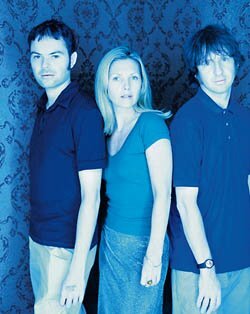 Saint Etienne's next albums continued to evolve, and I have loved every one. The jazzy pop of Good Humor, the electronic experimentation of Finisterre, the coffeehouse pop of The Sound of Water. They also released a brilliant remix album, Casino Classics. Their latest album, Tales from the Turnpike House, is a "concept" album about living in the London projects, and it simply gets better and better with every listen. As Jake wrote, Saint Etienne show that "pop music [can] be airy, incidental, danceable, and still beautiful, still epic, still poignant." I can't say it better, so I won't. Favorite Saint Etienne Song: "Mario's Cafe"; "I Was Born on Christmas Day"
Side note: It has been just over 12 years since I put on those headphones in the Virgin Megastore under the Louvre and changed my musical life. Saint Etienne have never been very big in the U.S., needless to say. But they are touring for their new album, and this coming Wednesday, I get to see them in concert. I cannot begin to describe my excitement. Basically all this post did for me was make me wish I'd gotten to the Rodin Museum while I was in Paris. letter a, the rodin museum was my fav, as well as the picasso. letter b, the carrousel is crazy cool. letter c, i wish i could come to the concert! unfortunately, i officially have 9.46 in my checking, which prevents activity of any sort, really. plans for my first paycheck: purchase new b&s, matt costa, and saint etienne. And you shall forever be credited as the person who passed the gospel of Saint Etienne on to me. "Hang them high above the town. Who weeps for these . . . weeps for corruption!" Oh, Judge Hathorne . . . good times. I could so see that happening in Brainerd. Basically the definition of Brainerd. Hey thanks for sharing such an awesome story. Wasn't that a great show tonight? Are you going to B&S next month? Yep, Nadeem. I'll be at the B&S show! Maybe I'll see you there. I love Foxbase Alpha, I even made myself a t-shirt with the logo! it was the firs saint etienne album I heard. I love the band but I never felt the same way with the other albums... I remember when I heard So Tough, I was really exited and it turn out to be too poppy for me, of course, I fell in love with Avenue and mario's cafe, but it wasn't the same. Nice 'review' by the way!